Delilah is shedding. Big time. 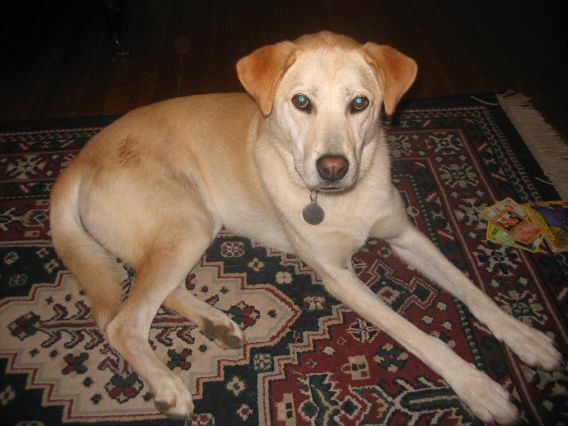 Our 2 1/2 year old yellow lab/husky mix is the sweetest dog in the world. But twice a year she sheds like crazy. In fact it’s more like she’s molting — perhaps she’ll come out of this as a crustacean. When she runs around she reminds me of Pigpen, except she’s followed by a cloud of fur rather than dirt. That’s a Peanuts reference for those keeping score at home. If you have a dog — and I’d love to hear from you — you know what we’re going through. I vacuumed the rug yesterday for no apparent reason. I mean it was nice to do since I was able to get up the needles from the Christmas tree. But it didn’t have any effect whatsoever on the dog hair. It didn’t help that I was wearing a fleece pullover; I now look like a dog. I’ll continue to take Delilah outside and brush her, though it just seems to make the hair multiply. I keep thinking if I could only invent a use for dog hair, I’d be rich. Maybe I can convince people that dog hair is the new goose down and start making coats. Sure, some people might be allergic to “doggie down” but caveat emptor (let the buyer beware).